Campfires are permitted. Firewood is available to purchase. 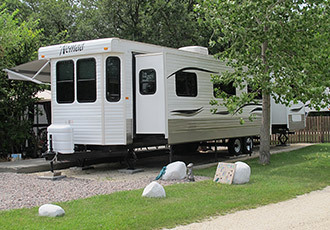 Campers pay regular admission fees to other areas of the park such as Kinsmen Lake and the Interpretive Centre. Due to the spread of Dutch Elm, Emerald Ash Borer, and other infectious tree diseases we do not allow outside firewood to be brought into the campground. Locally sourced firewood is available at the campground gate booth.